For this series, we invite our readers to share their favourite hiking route. Our guest writer today is a California native who has spent most of her adult life traveling and living overseas. Her name is Mimi, she sings, plays sports and writes the travel blog The Atlas Heart. Without further ado, Mimi, show us your hike! You can also reach her on Facebook, Twitter, & Instagram. 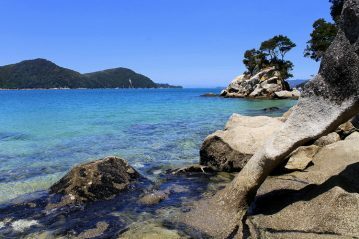 We woke up to the blue turquoise water softly crashing on the shore behind our tent. 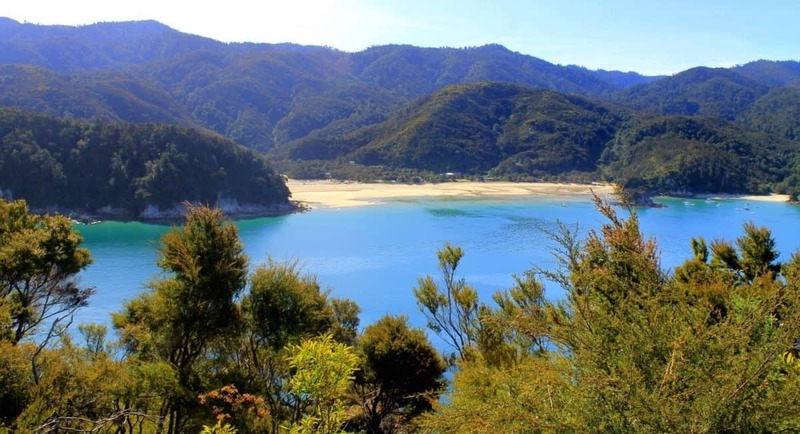 The bright golden sand welcomed us, the lush forests protected us from the intense New Zealand sun, and the abundant wildlife was the beat to our soundtrack. 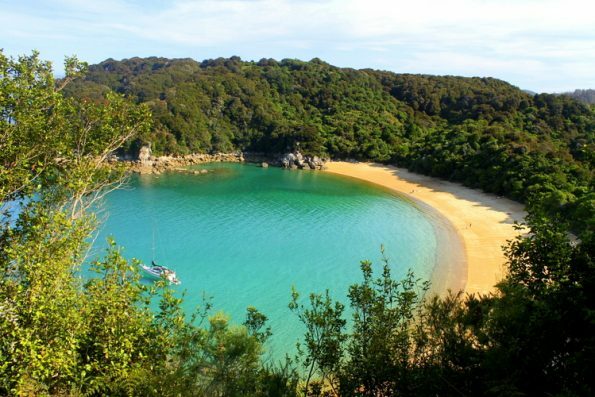 This was what we could expect every morning of our gorgeous 3-day hike on the Abel Tasman Coast Track. 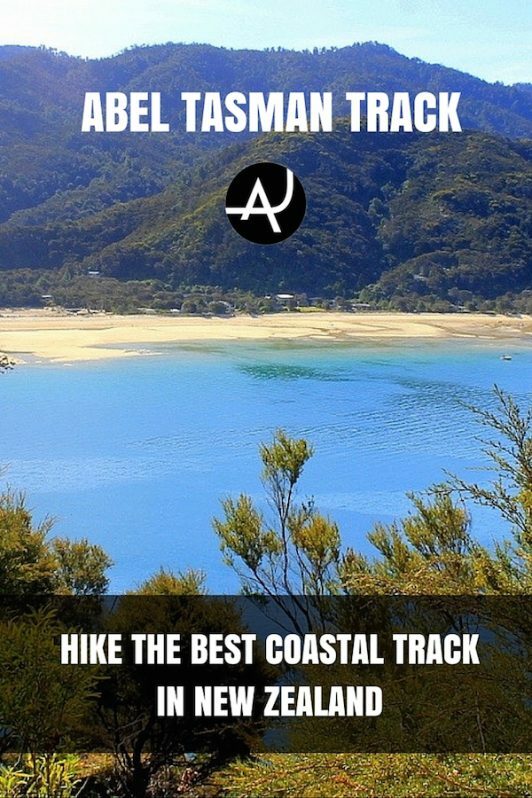 The Coast Track at Abel Tasman is considered one of the best multi-day hikes in the world by many, and it’s not hard to see why once you arrive. 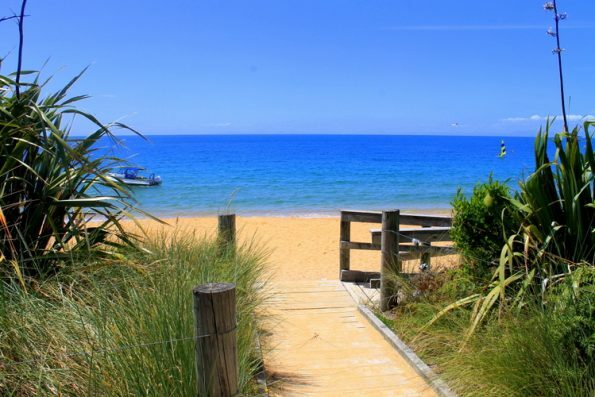 Situated in the top left corner of the South Island of New Zealand, about 1 hour outside the city of Nelson, Abel Tasman has everything going for it in terms of beautiful scenery. The track curves its way along the coast, taking you from the golden sand coves to the lush forests waiting just beyond the shore. There is a cyclical pattern of steep inclines and declines that are relatively short, but be ready to work your calves. 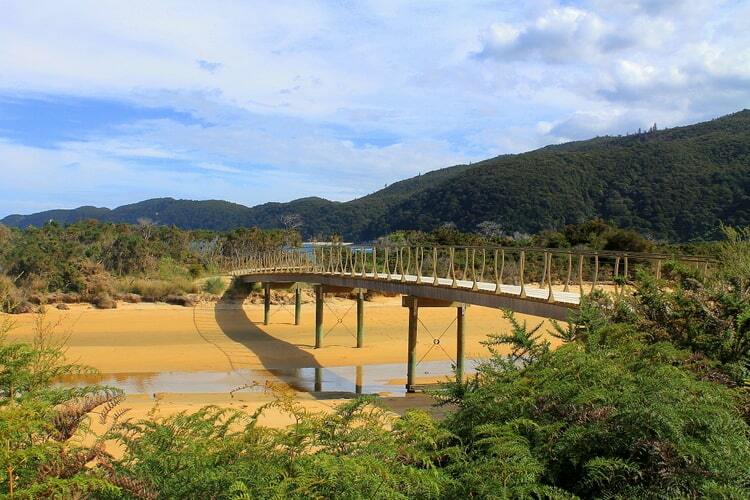 There is one part of the track at the Awaroa Inlet that is completely dependent on tidal crossing, so make sure to check the tide times before hiking through this part of the trail. You’re able to cross the inlet within an hour and a half before low tide and 2 hours after. 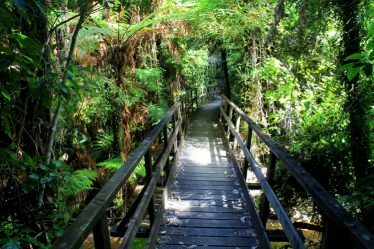 You’re able to start the hike from either direction, from Marahau, where most people begin the trail, or from Wainui Bay. 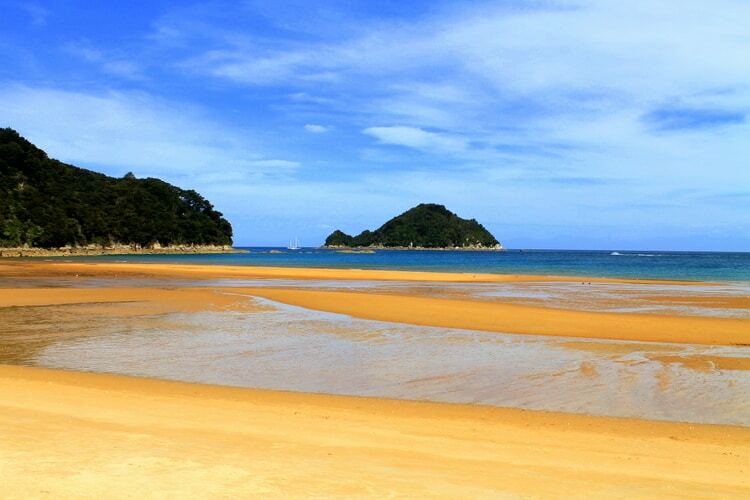 We actually started at Totaranui, about 15.5 km from the Wainui Bay side of the trail, heading towards Marahau. We decided to cut the hike down so that we wouldn’t feel rushed with only having 3 days to complete the trail. There are numerous DOC (Department of Conservation) huts and campsites along the trail. There are 4 huts and 18 campsites in total, with varying prices depending on the season and location. Overnight stays in campsites and huts are limited to two consecutive nights. My friend, Kelsey, and I had never been on a multi-day hike before, and considering the circumstances, I couldn’t have asked for a better outcome. We started our first day by taking a bumpy water taxi ride from Marahau to Totaranui, the start of our journey. Our first day was hard. Not used to carrying heavy multi-day packs, we quickly developed sore muscles and a few blisters. The trail was hot and dusty that first day, with little shade to rest from the sun. We quickly became used to the cyclical nature of the track, from the breezy coves, to the leafy forests. It was a thrilling and tiring 14.2 km that took about 5 1/2 hour to complete. During the first day, the trail disappeared a couple of times when it lead down to different coves, but all we had to do was find the bright orange flags that would signify the start of the trail again. 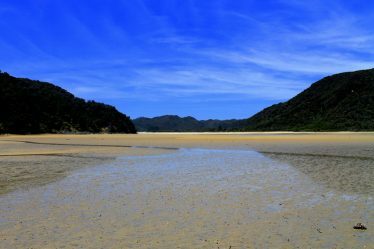 We also passed through our first low tide crossing at the Awaroa Inlet, where we had to take off our shoes, wade through shin deep water, and avoid the fast sand crabs even at the lowest tide of the day. We arrived at Onetahuti campsite in the late afternoon, and unfortunately found that we weren’t able to swim in the water because of the abundance of jellyfish. We soon found that we wouldn’t have had the energy anyway, collapsing immediately into a deep sleep after setting up our tents and devouring our dinner of baked beans and sausages. The sun hadn’t even properly set before we were snoozing away in our little tent, we were that exhausted from the day’s adventures. On the second day, we were incredibly sore but determined to take on the trail with the same amount of vigor as the day before. We packed up our camp and hiked our way through the Tonga Quarry, Bark Bay, and our second tidal crossing at Torrent Bay Village. 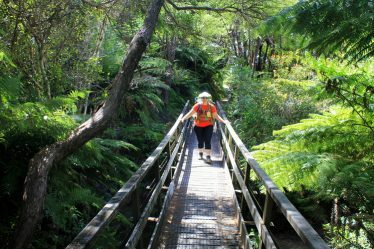 On the way from Bark Bay to Torrent Bay, we came across two swing bridges – one small and one large – that were a hoot to cross. I say this because my hiking partner is extremely terrified of bridges, and she didn’t know that any would be involved on the track. I had a blast jumping up and down and running along the moving bridges, hanging over the sparkling turquoise water. Kelsey, however, looked at me like I was a madman and refused to go across until I was at a safe distance away from the bridge on the other side. Fair call. Once we passed through Torrent Bay, we had our other tidal crossing to get to Anchorage, our camp for the night. We made it to Anchorage Bay within 30 minutes after walking through the sludgy wet sand. Anchorage campsite was much different from the one at Onetahuti. It was much larger, its facilities were well looked after, there were more campers around our age, and the swimming was much better with less jellyfish in the water. After 14.8 km and roughly 5 hours on the trail that day, I went on my own solo hike to Pitt Head for a gorgeous lookout and break from my big backpack. When Kelsey and I met up for dinner, we watched the cloudy sunset and fell fast asleep, content with our accomplishments for day two on the trail. On the third day, we woke with excitement. 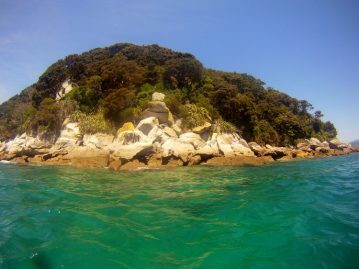 Before arriving to Abel Tasman, I booked a kayak tour for Kelsey and I to make it back to Marahau by kayak instead of on foot. So, with glee at soon disposing of our backpacks for awhile, we packed up and hiked a short (but incredibly steep) 30 minute hike to Watering Cove, where we would meet our kayak tour. 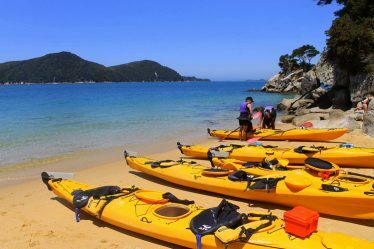 It turned out to be an amazing day exploring Adele Island and its fur seals by kayak. We had a good upper body workout paddling against the current to get out to the island, and a lovely little cruise back to the finish line for our return to civilization. 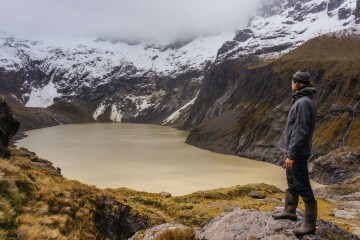 Overall, the Abel Tasman Coast Track was challenging, but I found it to be the perfect level of difficulty for my first multi-day hike (The Tongariro Crossing in winter was not so easy, let me tell you!). The weather was perfect and the terrain was difficult at times, but I still hiked it in just my running shoes as that’s all I had at the time. Most importantly, it is still one of the most stunning hikes I’ve ever been on, so I was happy that I chose to spend a quality amount of time on the trail to really take everything in and do it justice. 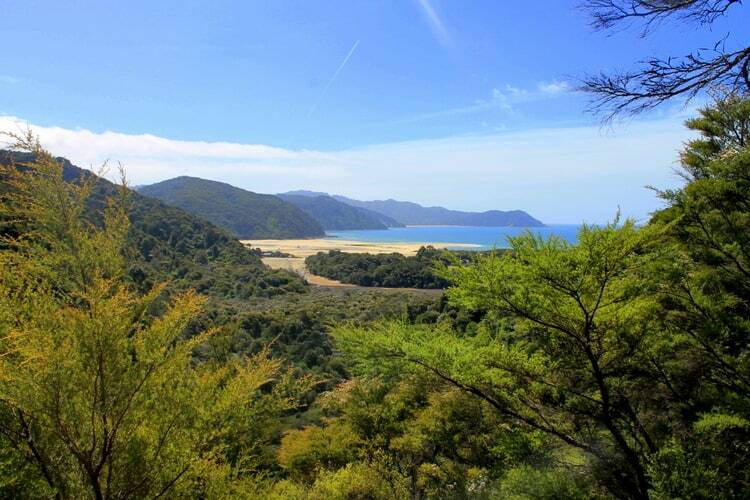 The views are wonderful every time you get to a lookout, which is about every 30 minutes or so on the Coast Track. The water color is absolutely perfect. The options for side trails to get off the beaten path and see a different part of the area. That it’s along the coast. 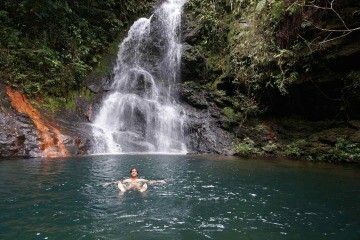 The availability of refreshing water to dip into is the best way to treat yourself at the end of a long day of hiking. The variety of the trail. Starting from a very desert-like dry area of the coast to finishing up at a much wetter and vibrantly green area. It is the perfect example of how quickly New Zealand terrain changes in no time at all. The constant steep uphill and downhill repetitiveness of the track was hard on the knees, but you got used to it after awhile. Sandflies – The worst. Make sure to bring the strongest bug spray you can find with you on the trail. It may have been due to a recent storm, but there were tons of jellyfish in the water throughout the whole track. Although, most of the ones close to shore were dead, it still made me uneasy swimming in the water. There are no trash cans on the trail, so MAKE SURE YOU CAN CARRY ALL OF YOUR TRASH with you the whole time. If you’re planning on doing the hike in the summer, BOOK YOUR ACCOMMODATION AHEAD of time as it’s an incredibly popular hike from October to April and the campsites/huts fill up very quickly. BOOK THE WATER TAXIS AHEAD OF TIME AS WELL. It’s not usually as simple as just hopping on one at the end or beginning of your journey, they usually need advance notice. Since this isn’t a circular track (unless you combine it with the Inland Track), you will need to find transportation to where you start or where you end – depending on which direction you choose to go. Mimi is a California girl who, after backpacking through Costa Rica, Europe, and Southeast Asia, decided to buckle down and live in the down under cities of Melbourne, Sydney, and Wellington over the course of two years. From jumping out of a plane in New Zealand, to eating snakes in Vietnam, learning how to cook in Italy, and scuba diving the Great Barrier Reef in Australia, she's always looking to live with an open mind and an atlas heart. She's now based in Portland, Oregon, the jumping off point for her next set of adventures lined up for 2015.